Mike was a victim of sexual abuse in his own home and never knew what it was like to feel safe and secure. That all changed 3 years ago when he arrived at Brian’s House, a residential home for teen boys operated by Children’s Home Society. Following a period of adjustment, Mike began to make rapid progress at Brian’s House and in school. He learned about our WingsNet program, which encourages and rewards academic achievements, consistent job performance, development of work skills, and maintaining a savings account. Mike was motivated by the WingsNet program and eager to participate. Within a few semesters, his high school GPA went from 2.0 to 4.0! Mike soon became a member of The Higher Achiever’s Club at his school and said that 2015 was the best school year ever. And now, for the first time, he’s even excited about and looking forward to beginning the next school year. We’re proud of Mike and looking forward to hearing more about his accomplishments. Thank you for supporting our WingsNet program and making a difference in Mike’s life and in the lives of many other at-risk youth in Central Florida. We’re looking forward to seeing YOU on October 3, 2015 for an exciting celebration of our 20th Annual Gala! In addition to gourmet food, open bar and exciting auction items, this year’s Gala will feature live entertainment from Think Big! These six men play music ranging from classic rock and dance tunes to Motown and everything in between. Be sure you’re a part of all the fun – get your tickets now! We are grateful for all the sponsors and donors who have contributed to make our Hope Rising 20th Anniversary Gala a great success! Our sponsors are one of the major reasons that Wings of Hope has made such an impact in the lives of at-risk young people. To see a complete list of our Sponsors and the companies and individuals who have donated auction items click here. 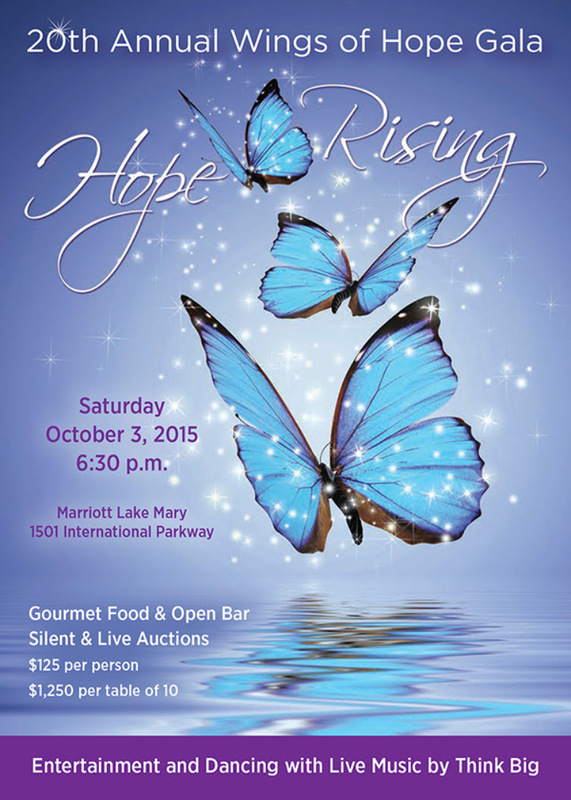 The Marriott Lake Mary special rate of $109.00 for Wings of Hope Gala attendees ends this this week on 9/3.